Although Brahms settled permanently in Vienna late in 1869, having frequented it for much of the foregoing decade, he regularly sought rural rather than urban inspiration during the summer, usually at quiet resorts in areas of natural beauty. Bad Ischl, in the Salzkammergut in Upper Austria, provided such a setting in 1880 and 1882, in the process becoming a much favoured site for later retreats. The F major Quintet was composed at Ischl in 1882, temporarily usurping the celebrated Op 87 Piano Trio in the composer’s attentions, and the G major Quintet emerged into the same surroundings in 1890. 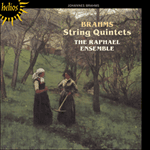 It is perhaps symptomatic of Brahms’s Classical orientation that both his String Quintets follow Mozart’s example in adding to the quartet ensemble a second viola rather than (as in Schubert’s C major Quintet) a second cello. 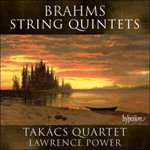 The F major Quintet begins without preamble, presenting a theme whose sober dress is reminiscent of the early B flat Sextet’s initial atmosphere. A rapid expansion of texture generates an opulent restatement followed by vehement dotted rhythms. The second subject, in the less than obvious key of A major, is a lilting triplet melody proposed by the first viola and taken up by the first violin against ‘pizzicato’ figuration from violas and cello. The development continues to explore sharp key areas, the vehicle for this being much characteristic use of simultaneous quavers and quaver triplets, at times seamlessly indivisible, at others confrontational and enhanced by syncopation (displaced accents straddling the main beat). In due course the recapitulation is heralded by inchoate attempts at the first subject which twice fail to find their prescribed direction before further use of the dotted figure inspires greater purpose and a climactic restatement of the entire theme is launched. It is symptomatic of Brahms’s conception of development as a relatively contiguous section of sonata structure, and of his Classical stance in treating it as a vehicle for tonal expansion via fairly ‘straight’ repetition of loosely derived material, that the quaver triplets initiated in this development section make no further appearance in the movement. In the recapitulation the second subject appears in D, making a predictable shift back to the tonic key of F at its half-way point. The sudden access of energy in the coda’s concluding bars seems a conscious token gesture after a deliberately measured and ‘low-key’ movement (later to be appreciated as the shrewdly conceived foil to a notably boisterous finale). The second movement presents a relatively rare example in Brahms of synthesis of the characteristics of two movements by means of alternation. A comparable instance occurs in the Violin Sonata No 2 in A, Op 100; but whereas that movement’s slow music epitomizes the quasi-narrative manner of the late solo piano works (Opp 116–119; in particular the Romanze, Op 118 No 5), the Grave ed appassionato of Op 88 articulates a profoundly melancholy introspection. Taking the unlikely key signature of C sharp minor in response to the A major tonality of the preceding movement’s second subject and to the D flat repetitions announcing its recapitulation, the Grave at once perplexes the issue by starting apparently in C sharp major and then casting doubt as to whether this is the tonic or dominant key. C sharp minor tonality establishes itself only in bar five and even thereafter the music remains perpetually transitional in feeling. Despite an exceptionally slow pulse (reminiscent of such late Beethovenian conceptions as the Adagio of that composer’s last cello sonata, Op 102 No 2) there is a perceptible gravitational pull towards the second beat of each 34 bar, achieved by the placing of longer notes in mid-bar after the fashion of an excessively funereal sarabande. The austere and attenuated end of this section seems to threaten black misanthropy and gives no clue as to what will follow. The ensuing Allegretto vivace section dispels gloom without providing explanations. Its lilting rhythms and gentle pastoral character seem to hint momentarily at what the young Carl Nielsen may have taken from Brahms. A return to the opening manner and matter merely intensifies the mystery, although one can appreciate that the displaced accentuations of the Allegretto’s compound time-signature and those of the Grave have been subtly induced to provide an underlying rhythmic kinship between seemingly irreconcilable material. A Presto follows, this being a through-composed variation of the Allegretto. These two sections having been in A major, the concluding Grave adopts that key in which to restate the opening material with its attendant ambiguities intact. A strikingly remote and somehow nerveless peroration sows confusion as to the ultimate tonal destination. After wavering between C sharp major and A major the music conclusively reaches the latter via the unexpected intervention of D minor. In this ostensibly eccentric tonal scheme one can by now detect the possible guiding hand of Schubert: the progression F–A–C sharp–F encompassed by the Quintet’s three movements exploits a rotational principle based upon the augmented triad, just as Schubert does to strikingly cohesive and original effect in his ‘Wanderer’ Fantasy for solo piano of 1822. One need look no further than the opening of Brahms’s own first Piano Sonata, Op 1, to see the impact of the ‘Wanderer’ upon him in specifically pianistic and thematic terms. The Quintet’s finale opens with two peremptory chords whose tonic/dominant relationship is perhaps calculated to restore diatonic order within the re-established principal key. These launch a fugal subject of headlong rhythmic energy, stated by the first viola. The character here is strongly reminiscent of the finale in Beethoven’s third ‘Razumovsky’ String Quartet, Op 59 No 3, of which Philip Radcliffe wrote: ‘The fugal element plays an important part in the movement, but it is the powerful rhythmic drive and the broad harmonic outline behind the counterpoint that gives the music its peculiar exhilaration … and the result, judged on its own merits, is irresistible’ (Beethoven’s String Quartets, Cambridge, 1965). He could have said the same of Brahms’s Op 88 finale with equal justice. Each of Brahms’s subsequent fugal entries is ‘detonated’ by a further pair of emphatic chords, these responding to the dictates of a fugal alternation of tonic and dominant entries by themselves changing the order of their appearance. The sheer kinetic effect of this, though rooted in Beethoven, might well remind a modern listener of Robert Simpson, both through its dynamic force and because of its concern with moment-by-moment organic ‘mechanism’ or process as much as with outward form. After four fugal entries (the last shared by cello and second viola in octaves) a boisterous theme is declaimed by all five players. The free use of octave doubling (particularly in compound form between the outer parts), the continued insistence on tonic and dominant, and the ‘ostinato’ rhythm create a somehow vernacular effect reminiscent of Brahms’s Academic Festival Overture. Possibly Ischl reminded the composer too of that work, which he had composed there in 1880 during his only previous visit. The rest of the finale requires little comment, so eloquently and joyously does it speak for itself. The riotous coda is a marvel of rhythmic mischief, the skill of which may be gauged only by comparing the aural effect with the printed score. The latter shows that the actual rhythm is extremely simple; but the unrelenting ostinato rhythm leading up to this has rendered the ear almost unable to accept previously unaccented pitches as newly accented ones, and vice versa, with the devilishly ingenious result that innocent symmetry communicates momentarily as riotous dislocation. 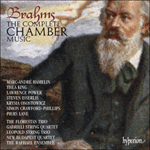 There are few, if any, more capriciously exciting moments in Brahms’s output, and few works which more perfectly match forces to substance. The lessons of Op 51 have been triumphantly absorbed. Bien que Brahms s’installât de façon permanente à Vienne à la fin de l’année 1869, ayant fréquenté cette ville la plus grande partie de la décennie écoulée, l’été il cherchait régulièrement son inspiration plus à la campagne qu’à la ville, en général dans les lieux paisibles aux paysages naturels de grande beauté. Il allait trouver cette inspiration à Bad Ischl dans les Alpes autrichiennes en 1880 et 1882, une région qui allait plus tard devenir une de ses retraites préférées. C’est à Ischl qu’il composa en 1882 le Quintette en fa majeur, qui pour le compositeur était une usurpation temporaire du Trio pour piano op.87 dont on a fait l’éloge. C’est en 1890 dans ce même contexte que le Quintette en sol majeur a vu le jour. L’orientation classique de Brahms se caractérise peut-être par le fait que ses deux quintettes à cordes suivent l’exemple de Mozart, avec l’addition au quatuor d’un second alto plutôt qu’un violoncelle (comme dans le Quintette en do majeur de Schubert). Le Quintette en fa majeur débute sans préambule par la présentation d’un thème dont la retenue rappelle l’atmosphère initiale du Premier Sextuor en si bémol. Le deuxième thème, dans la tonalité quelque peu inattendue de la majeur, est constitué d’une mélodie cadencée de triolets lancée par le premier alto et reprise par le premier violon sur un fond de pizzicatos exécutés par les altos et les violoncelles. Le morceau se poursuit dans une exploration de régions tonales sensibles véhiculée par l’utilisation caractéristique de croches et de triolets trillés. La récapitulation finale est annoncée par des tentatives inachevées pour reprendre le premier thème, tentatives qui manquent par deux fois de prendre l’orientation prescrite avant que l’utilisation de notes pointées n’inspire de plus amples aspirations et que soit lancée à son point culminant une réaffirmation du thème entier. Dans la récapitulation, le deuxième thème apparaît en ré, effectuant ainsi en son milieu un retour prévisible en clé de fa. La soudaine montée d’énergie des dernières mesures de la coda semble témoigner d’un geste conscient après un mouvement informel délibérément mesuré (qui sera plus tard apprécié comme une judicieuse contrepartie à la remarquable exubérance du finale). Par les altérations inattendues à la clé de do dièse mineur en réponse à la tonalité de la majeur du second thème du mouvement précédent et aux répétitions de ré bémol annoncant sa récapitulation, le Grave trouble la situation par un début apparent en do dièse majeur puis en jetant le doute sur la qualité tonique ou dominante de la tonalité. La tonalité de do dièse mineur ne s’impose qu’à la cinquième mesure et par la suite, la musique inspire malgré tout le sentiment de perpétuelle transition. Malgré une pulsation exceptionnellement lente, un certain glissement gravitationnel vers le deuxième temps aux trois quarts de chaque mesure est perceptible et est réalisé par le placement de notes plus longues en milieu de mesure, à la façon d’une sarabande funéraire. Le caractère morne de la fin de ce passage ne laisse aucunement présager de ce qui va suivre. L’Allegretto vivace qui s’ensuit disperse la mélancolie. Ses rythmes cadencés et son caractère pastoral laissent deviner ce que le jeune Carl Nielsen a pu apprendre de Brahms. Le finale est ouvert par deux accords péremptoires dont la relation tonique/dominante est peut-être prévue pour restaurer l’ordre tonal au sein de la tonalité principale rétablie. Ces accords lancent un thème fugué avec une énergie rythmique débridée affirmée par le premier alto. Chaque entrée fuguée consécutive est puissamment «propulsée» par une paire d’accords emphatiques répondant aux impératifs d’une alternance fuguée d’entrées dominantes et toniques, changeant d’elles-mêmes leur ordre d’apparition. Après quatre de ces entrées (la dernière étant partagée en octaves par le violoncelle et le deuxième alto), les cinq musiciens déclament ensemble un thème fougueux. L’utilisation libre d’octaves doublées (en particulier sous forme de combinaison entre les parties extérieures), l’insistance soutenue sur la tonique et la dominante et le rythme de l’«ostinato» donnent un effet quelque peu vernaculaire qui rappelle l’Academic Festival Overture. Il est possible qu’Ischl rappelait également au compositeur cette œuvre qu’il y avait écrite en 1880 lors de sa seule visite précédente. Obwohl Brahms sich spät im Jahr 1869, nach recht häufigen Besuchen der Stadt im letzten Jahrzehnt, permanent in Wien niederließ, suchte er oft im Sommer eher ländliche als städtische Inspiration, normalerweise in stillen Erholungsorten in Landschaften natürlicher Schönheit. Bad Ischl im oberösterreichischen Salzkammergut bildete 1880 und 1882 diesen Rahmen und wurde im weiteren Verlauf zu einem sehr geschätzten Ort späterer Rückzüge. Das Quintett in F-Dur war 1882 in Ischl komponiert worden, indem es vorübergehend das gefeierte Klaviertrio op. 87 aus der Aufmerksamkeit des Komponisten verdrängte, und das Quintett in G-Dur kam 1890 in derselben Umgebung zum Vorschein. Vielleicht ist es für die klassische Orientierung Brahms’ symptomatisch, daß seine beiden Streichquintette dem Beispiel Mozarts folgen, indem dem Quartettensemble eher eine zweite Viola als (wie im berühmten Quintett in C-Dur von Schubert) ein zweites Cello zugefügt wird. Das Quintett in F-Dur beginnt ohne Einleitung und präsentiert eine Melodie, deren dezentes Gefühl an die Anfangsatmosphäre des frühen Sextetts in B erinnert. Das zweite Thema, im weniger als offensichtlichen A-Dur, ist eine beschwingte Melodie im Tripeltakt, zuerst aufgenommen von der ersten Viola, dann wiederaufgenommen von der ersten Violine gegen das „Pizzikato“ der Violen und des Cellos spielend. Die Entwicklung erforscht weiterhin „erhöhte“ Tonartgebiete, vorangetragen von der charakteristischen Anwendung simultaner Achtel- und Tripelachtelnoten. Im weiteren Verlauf wird die Reprise durch unvollendete Versuche des ersten Themas angekündigt, die zweimal ihre vorgeschriebene Richtung nicht finden, bevor die weitere Anwendung der punktierten Figur einen größeren Zweck inspiriert und eine Neudarstellung des gesamten Themas als Höhepunkt präsentiert. In der Reprise erscheint die zweite Melodie in D, indem auf halbem Weg ein vorhersehbarer Wechsel zurück zur F-Grundtonart vollzogen wird. Die plötzlich freigemachte Energie in den Schlußtakten der Koda scheint eine bewußt leere Geste zu sein, nach einem absichtlich eingeschränkten und formellen Satz (der später als die weise Gratwanderung zu einem bemerkenswert tosenden Finale seine Wertschätzung erhielt). Das Grave nimmt die merkwürdige Tonart-Vorzeichnung in cis-Moll als Antwort auf die Tonalität in A-Dur der zweiten Melodie des vorherigen Themas und auf die ihre Reprise ankündigenden Des-Wiederholungen und schafft zugleich durch seinen scheinbaren Beginn in Cis-Dur und die folgende Ungewißheit, ob diese die tonische oder die dominierende Tonart ist, Verwirrung. Die Tonalität in cis-Moll setzt sich selbst lediglich im fünften Takt durch, und selbst danach verbleibt die Musik vom Gefühl her ständig im Übergang begriffen. Trotz eines außergewöhnlich langsamen Rhytmus ist eine Schwerkraft hin zum zweiten Schlag jedes Dreivierteltaktes wahrzunehmen, die durch den Gebrauch langer Noten in der Taktstrichmitte, einer Begräbnis-Sarabande ähnlich, hervorgerufen wird. Das düstere Ende dieses Teils gibt keinerlei Hinweis auf das Bevorstehende. Der folgende Allegretto vivace Teil vertreibt die Düsterkeit. Sein beschwingter Rhytmus und pastoraler Charakter scheinen das anzudeuten, was der junge Carl Nielsen von Brahms gelernt haben mag. Das Finale des Quintetts beginnt mit zwei gebieterischen Akkorden, deren Verhältnis als Tonika und Dominante berechnet ist, die tonale Ordnung innerhalb der wiedergebildeten Haupttonart wiederherzustellen. Sie präsentieren, dargelegt von der ersten Viola, eine Fugen-Melodie von überstürzend rhytmischer Energie. Jeder der anschließenden fugalen Einsätze Brahms’ wird durch weitere Paare emphatischer Akkorde „gesprengt“, die den Diktaten eines Fugenwechsels zwischen tonischen und dominanten Einsätzen wie von selbst nachkommen und die Reihenfolge ihres Erscheinens ändern. Nach vier solchen Einsätzen (deren letzter in Oktaven zwischen Cello und Viola aufgeteilt ist) wird eine aufgewühlte Melodie von allen fünf Musikern vorgetragen. Der freie Gebrauch der Oktaven-Doppelung (besonders in verstärkter Form zwischen den äußeren Sätzen), das Fortbestehen von Tonika und Dominante und der „ostinato“ Rhytmus bilden einen irgendwie volkstümlichen Effekt, ähnlich Brahms’ Akademischer Festouvertüre. Ischl erinnerte den Komponisten möglicherweise auch an die Arbeit, die er 1880 während seines einzigen vorherigen Aufenthalts dort komponiert hatte.